Okay, Picture Book Month is over. Now it is time for...zombies! Not to worry. I'm not doing a month on them. I'm not even all that enthused about zombies. I've read a couple of good books, seen a few movies, and that's about all I need. Especially since many zombie books are also apocalyptic novels. And, as Garrison Keillor once said about pumpkin pie, the best apocalyptic novel you've ever read isn't that much better than the worst. That's why I ignored Rot & Ruin by Jonathan Maberry for a long time when it was on my library's new YA shelf. It wasn't until I saw a review for one of its follow-up books that I gave the first book in the Rot & Ruin series a second thought and made a point of finding it. What makes this book so intriguing is that while it is set in a vague American future, it has a western vibe. The characters in this book are fourteen years into zombie world and the little group we're interested in are living in a small town they've created to keep themselves safe from the zombie horde. One character goes so far as to compare the people living there to western townspeople protecting themselves from Native Americans. Horses figure in the story because society has fallen and power for machinery is limited. Our protagonist's older brother fills the roll of the lone gunslinger with his own code, making him noirish, too. There's no law in these parts, so you've got outlaw types who are far worse than the zombies, just as you had outlaws in westerns. Our heroes head out of town to save their woman from said outlaws. There is even a scene that calls to mind the cavalry coming over the rise to save the day. For those of us who grew up with parents who watched westerns on TV every night of the week, it's fun to pick up all the western, well, cliches. (I didn't enjoy doing this anywhere near as much while watching Defiance.) It's been a long time since television was populated by cowboys, though. The western connection won't be an issue one way or the other for younger readers. 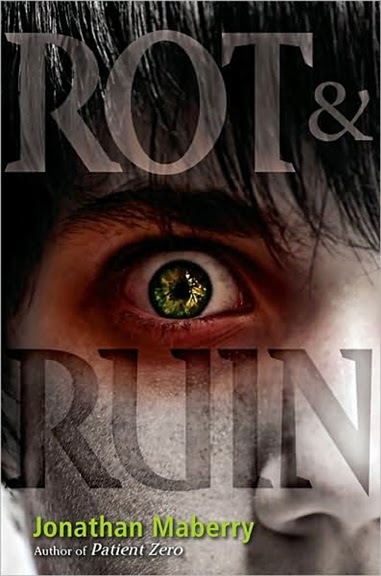 Rot & Ruin is an apocalyptic novel that works for me because the society in it isn't stagnant. So often in these books the world goes to pieces and stays that way for generations. No one shows any interest in technology or even changing the height of a hemline. Given the last 500 years or so of human existence, that seems unrealistic to me. Cultures evolve. And there are suggestions that the culture portrayed in Rot & Ruin is going to. It's only been 14 years since the world fell to zombies, and already the young people who are growing up there are thinking that they'd like something better. If the zombies come, it seems likely to me that before long people are going to get sick of them and start thinking of ways to make a better life. Trying to make a better life is what we do.